How to get things done when you don´t have enough time in the day? I read this question a few days ago and decided to turn my answer into a blog post because I believe that most of us are struggling from time to time with the same issue. The feeling of not being able to get enough things done in a day and the perception of not having enough time to do so. Having a lot of things on your plate and trying to manage to get all of it done during the day can be stressful especially without a clear strategy. You might feel overwhelmed by all the things you want to accomplish and have to do in the little time frame you have. There are a few things, however, you can do to get it done even though you feel that you don´t have enough time in the day. I´m going to share with you 8 time management tips which will probably help you to make your problem disappear. 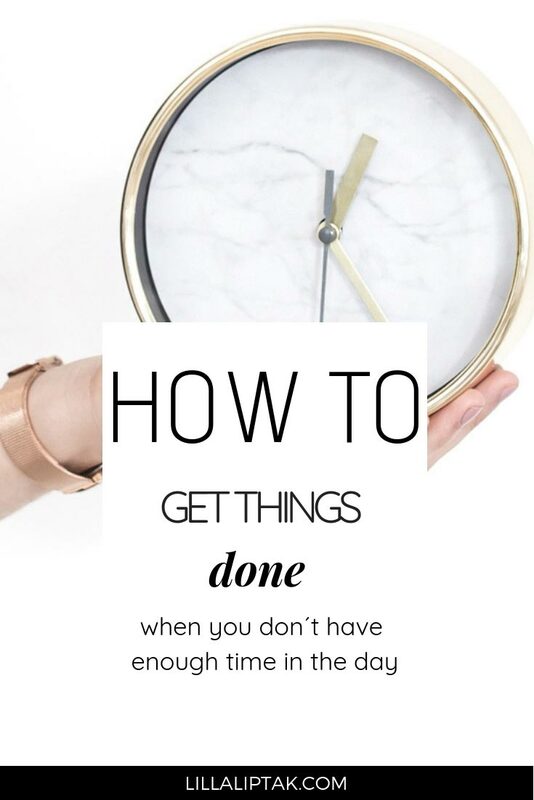 Before I dive into the strategies of how to get things done when you don´t have enough time in the day, I want to share with you 2 time management hacks you might find helpful and valuable. All you need is a notebook and a pen to get started. I love to use this notebook and this pen for planning. My time management hack number 1 is creation vs. consumption. The average daily social media usage worldwide is increasing and was in 2017 at 135 minutes per day/person. The New York Times reported a study in 2016 that the average American adult is spending 5 hours and 4 minutes per day watching tv. This being said the average person is spending more than 6 hours per day consuming stuff either on social media or tv vs creating something. Now I want you the o do following. Track your personal behavior of creation vs consumption on a daily basis for the period of 1 week. When are you working towards your business, your dream or your goal vs. when are you just browsing through social media or Netflix? Try to observe your daily habits and note it down in your journal to see with what you are spending the time of your day. As next step, you can see where you can cut off some time and use this time for creation instead of consumption. Note it down into your journal so it won´t get lost. If you are never on social media and don´t ever watch tv no worries I have a few more hacks on how you can save time during the day to get the things you want to be done. Batching means in the broader sense to group/bundle same or similar tasks together. For a great result, you can batch same or similar tasks together and do them at once instead of doing them separately scattered across the week. It has the positive effect for you to come into a sense of flow. You are doing the same or similar things for a longer time period instead of switching around from different task to task. You can batch your cleaning and clean your house once a week instead of cleaning every day here and there. For example, cleaning the whole house every saturday morning. Or do your laundry once a week. You can also batch your content if you are a creative entrepreneur. I, for example, like to batch my Pinterest pins. I schedule 4 hours for 4 days every month to design and create a few new pins of my blog posts for Pinterest. Other entrepreneurs, like the marketing expert Amy Porterfield or the author Kate Northrup, use batching for recording their podcasts. They don´t record just 1 episode per week but 4 to 6 episodes at once per month. The American best selling author and entrepreneur Tim Ferriss, on the other hand, love to batch his emails. He is only checking his emails once per week. Make yourself a list in your journal with all the things you can batch per day / per week / per month. Once you are done it´s time to master the 5 strategies on how to get more things done when you don´t have enough time in the day. 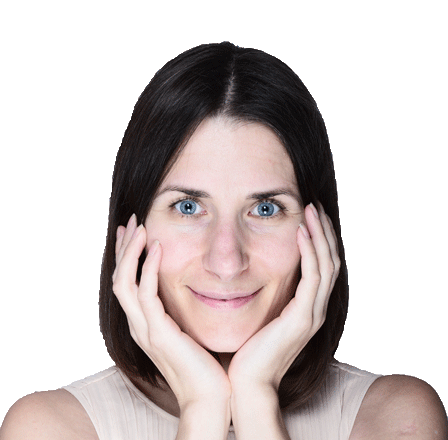 Don´t miss to also check out the 5 PRODUCTIVITY TIPS TO SKYROCKET YOUR SUCCESS! The first thing you need is the right mindset before you start the day and before you start your work. With the right mindset I mean to see the facts and not to get caught up in negative chatter like “I can´t do that”, “It´s too much work”, “I will never get done with it” etc. When we have a lot of things to do plus have negative chatter in our mind it can quickly lead to negative feelings and lead us to be overwhelmed. I´ve experienced this myself a few times already, especially as a student before exams. Whenever I had negative thoughts about all the things I had to do –>, in the end, I felt so overwhelmed that I did nothing. Most of the time I even fell asleep. At that time I didn´t know that overwhelm is just a concept of our mind. It´s about how we perceive the things and how much weight we put on it. Our mind likes when everything is easy and consistent. Our brain loves plans and routines. Plus it doesn´t know any better and simply believes what we tell our mind to believe. If we tell our mind that something is horrible, difficult and we can´t solve it our mind follows what we tell and prevents us from doing it. In my case it made me fell asleep. Not the situations create overwhelm, but how we perceive the situation and how we think about it. We can prevent ourselves from feeling overwhelmed by checking on our thoughts and direct our focus on the positive things in our lives. Planning ahead is another effective tool to get things done. The best way to do so is to plan out the next day every evening before going to bed. Make a plan every evening before you are going to bed about the things you want to accomplish the next day. Make 2 columns on your in your journal. Write down in one column all the urgent things and in the second all the important things you want to accomplish the next day. Urgent things are the things which have to be done and important things are the things which bring you closer to your goal. Schedule all the tasks you want to do the next day with a given time limit. Not only schedule an approximate time for your task but give yourself an exact time limit within a time frame. If you don´t know how long it will take, guess it, give yourself a time limit, set yourself a deadline and schedule it. Your task will take as long as you give yourself to get the task done. You might have experienced this phenomenon already in the past, that whenever you had a deadline you became suddenly more productive. This is due to the fact that we tend to take more time to accomplish a task when we give ourselves more time to do so. If you want to get things done, give yourself the favor and set a tight time limit and a deadline. Steven Pressfield, the author of THE WAR OF ART and of DO THE WORK, suggests knowing the difference between the urgent and between the important tasks in your own life. Important tasks are the things which bring yourself closer to your goals to live your dream. For example: launching your website, writing a book, buying a house, quitting your job etc. Urgent things, on the other hand, are the things which are coming from outside constantly but not bringing you towards your goals. For example, emails and social media messages from your friends, which you know should answer sooner or later. Do the important tasks first followed by the urgent tasks. Why? Because you would do the urgent tasks anyway, but you might postpone the important tasks, which lead you towards your dream life. Define which tasks really move the needle to get yourself closer to your goal to live your dreams. We all have to do things we don´t want to, but it doesn´t make sense to constantly spin your wheels on tasks which don´t bring you closer to your goals at all. For example, cleaning the house or buying food in the supermarket. My personal rule of thumb is to define for every day 1 thing which moves the needle forward for you to reach your goals. Whenever you don´t have much time making sure that at least you do the 1 thing which moves you closer towards your goal. May it be a little thing like a phone call or an email. It doesn´t matter how big this thing is, what matters is that you are constantly moving towards your goal every day. What can I do tomorrow that will move the needle towards my dream? When you have more time the next day make sure to plan in also other tasks. Try to not focus on more than 1 – 3 tasks per day. It may seem like nothing, but when you have a 10-year plan in place and break it down into little chunks and small pieces it can be enough to make 1 little thing per day to reach your goals within a specific time frame. Check your personal creation vs consumption ratio and make sure that you create more and consume less. Batch similar or same tasks together and do it all at once in a given time frame. Know that overwhelm is just a concept of your mind. Your thoughts define how you feel. Detect your negative thoughts and turn them into the positive vehicle for driving you to your dream life. Before you go to bed at night make sure to plan ahead the tasks you want to accomplish the next day. Schedule all tasks you want to get done within a time frame. Set yourself a deadline for the tasks you want to accomplish. Define the important tasks which are the tasks driving you towards your dreams vs the urgent tasks which have to be done anyway. Do the important tasks first. Which task is making an impact when it comes to your dream life? Define the task which will bring you closer to your goal and do it first. Select 1-3 tasks per day you want to accomplish and focus to get at least 1 of them done. What is your most effective strategy to get things done? Feel free to share it with us in the comments below. dream you are working on right now? Stay focused on your goals, track your habits and get things done! Download it for FREE, print it out and use it in your bullet journal to track your progress. 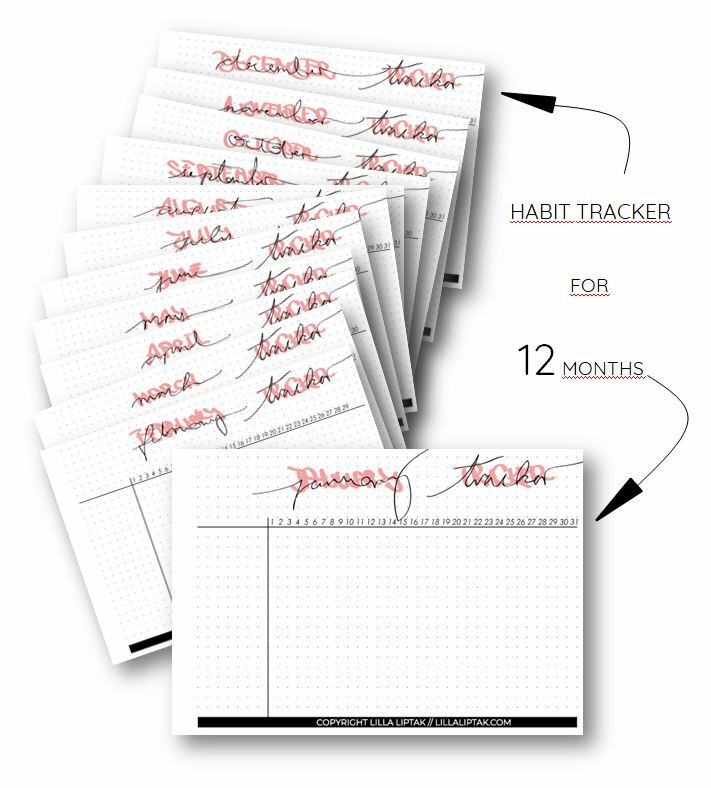 Yes, I want to connect, stay tuned and get the habit tracker! No thanks – please just send me the habit tracker! This is so much help especially these days when time is never my own… Thank you for this post, Lilla!